Christmas is here and with it comes colder temperatures, lots of decorations and holiday cooking. I just wanted to take a moment and share a few warnings to help keep our Feathered ones safe this season. I know many of you are already aware of these things, but if you are like me than a reminder is always good :). We also need to keep in mind that many of the things we decorate with, can be harmful or even fatal to our birds. Poinsettia are very toxic to our birds! I use silk ones now for the holidays, keeps my Angels safe and saves some dollars by just reusing them each year. Here is a link from Mytoos on Safe and Dangerous Plants and Trees. Keep in mind if you aren’t sure and don’t see the plant on the list, treat it as poison until you can find out for sure. Also if you use artificial trees, keep in mind that they are sprayed with fire-retardant chemicals that I am sure could be fatal to our birds if ingested. Real trees are also sprayed to prevent bugs etc so all trees truly need to be treated as off-limits for our Feathered ones. These magical sparkling trees in our homes look like a huge birdie play stand to most of them lol. However the garland, ornaments, tinsel, lights etc can all pose as very dangerous for our babies to chew on or in get caught in. Please use great care with your babies during this season, and keep them at a safe distance from those trees. Packages are also a huge temptation for feathered ones. Many papers use inks that could also be very toxic or harmful. We do wrap and give gifts to all of our birds, but we make sure that the paper is safe and only allow our birds to open in our presence :P.
We do a lot more cooking and baking this time of year. Most of us are very aware of the toxic fumes that come off of teflon, but also remember that a great deal of baking pans are coated with teflon as well. There are many other dangers also like self-cleaning ovens, oven cleaners and even roasting bags. Here is a partial list of Toxins and Poisons. We also need to be very careful of cooking when our birds are free flighted or even just loose in our homes. Accidents can happen very quickly when cooking and your attention is distracted for even a moment. Birds have very sensitive and complex respiratory systems and feel the effects of airborne pollutants and toxins faster than we do. Kitchens contain temperature and humidity extremes as well as potentially harmful fumes from cooking and cleaning products. Possible smoke from burning foods are common in kitchens and may also adversely affect birds. I do not advise on keeping birds housed in kitchen ever. When cooking, it is best to make sure your birds are safely kept in another room or in their cages so that they are safe from harm. We all love to use beautiful candles for decorations but these can also be very harmful to your birds. The number one concern of course are toxic scents that come from essential oils used in making most candles. They can be hazardous to parrots when they are burned. Parrots can become ill and even die from a single exposure if they are placed in a confined location where they are not able to escape from the dangerous fumes. You always have to be extremely careful of any open flames, your bird can fly into the flames or knock the candles over which could result in burns from the flames or the spilled hot wax. There are some candles that are made from only natural scents and with lead free wicks that are safer to use, but you should always use great caution with your birds with any open flames. Although you might never imagine it, holistic health items can also be toxic to your parrot as well. One of the most dangerous is tea tree oil. Many people like the idea of adding tea tree oil to their humidifiers. If you have a bird in the same room you should avoid this practice. The fumes from tea tree oil can be especially dangerous to your bird. There are also many other common household items that can prove to be dangerous to your parrot, including plug-in air fresheners, scented sprays and any aerosolized chemicals that have a strong scent to them. We can still have wonderful scents fill our homes safely by just boiling water and placing some natural items into the water and simmer like cinnamon sticks, orange peel, dried vanilla beans, tea bags, nutmeg, vanilla…just about whatever scent you like is easily made using all safe and natural items. This also saves a lot of money and healthier for you as well :). Nothing nicer than a warm cozy fire going, but you want to make sure that your fireplace is very well vented and no smoke is coming into the room where your bird is. Before winter sets in it is best to make sure your fireplace chimney is cleaned properly. It is also a good idea to have carbon monoxide detectors in your home, not just for the fireplace but for the heat and for your protection as well as the birds. Here are some great articles on using a fireplace with Parrots in your home. We also need to be prepared for power outages. If you live in an area that gets extremely cold you are going to need to be prepared to keep your Angels warm and safe. We have a generator, since it is common for our power to go out for days at a time here. There are many things that you should still keep on hand just in case. First you want to make sure that you always have plenty of extra food on hand, such as pellets, nuts and seeds, dried fruits and veggies. Any foods that can keep without the need of refrigeration. You also want to make sure that you have plenty of fresh drinking water on hand should pipes freeze, burst or become contaminated. We keep several gallons and rotate them out during the year so that they stay fresh. You always want to make sure that you have an Avian First Aid kit on hand. Here are two great links for making your own Avian First Aid Kits Avian First Aid Kit by Exotic Pet Vet and FIRST AID KIT from Land of Vos. You also want to have plenty of warm blankets that you can cover cages with. Flash lights and batteries are also very important. Just make sure that you realize a sudden light can startle your birds as it will be an unknown moving object to them. We use ours frequently throughout the year so that our birds are used to them. 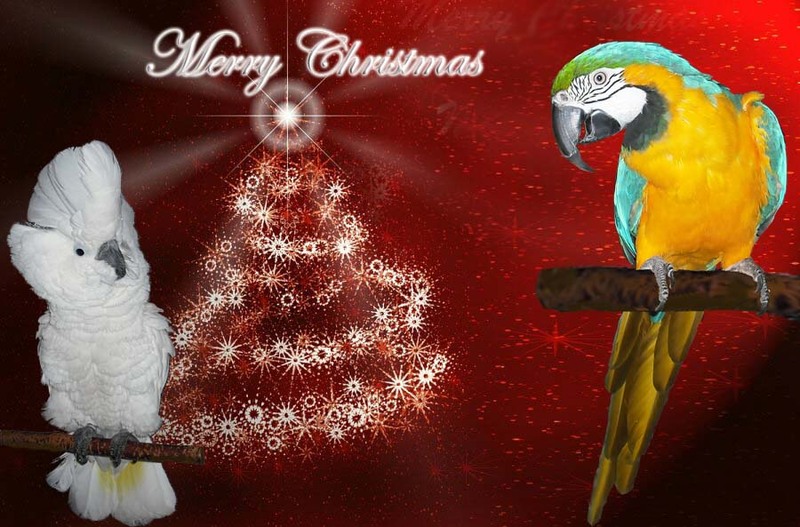 Make sure you also have lots of toys to help keep your birds entertained during these times. Remember also that if you are stressed they are going to feel this as well, try to remain calm and it will help your birds to accept the power outages as well. You also want to make sure that you have your birds carrier on hand and ready to use always. VERY IMPORTANT! – Never use Kerosene heaters or lamps around birds as the fumes may be toxic and can kill your bird.